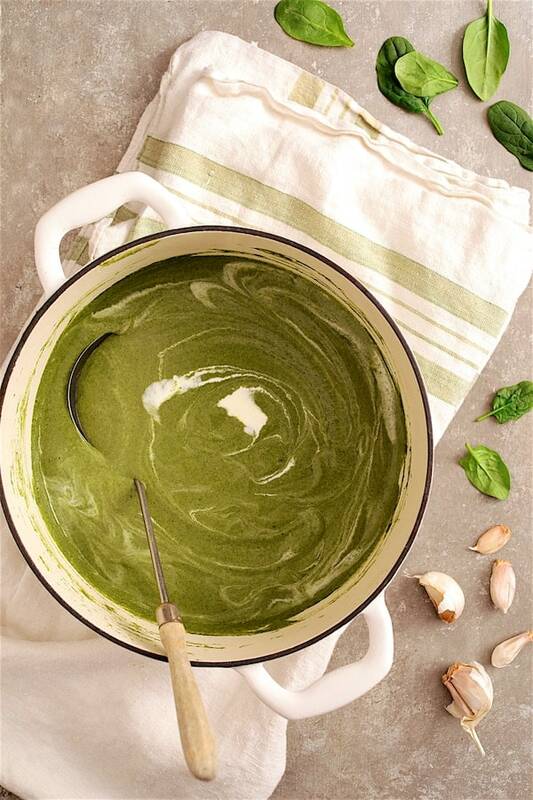 Elegant Spinach Goat Cheese Bisque is silky and creamy with just the right amount of tanginess. Crispy Lemon Chickpeas and a dollop of Greek yogurt are the perfect toppings! Spinach lovers! Goat cheese lovers! Have I got the soup for you! 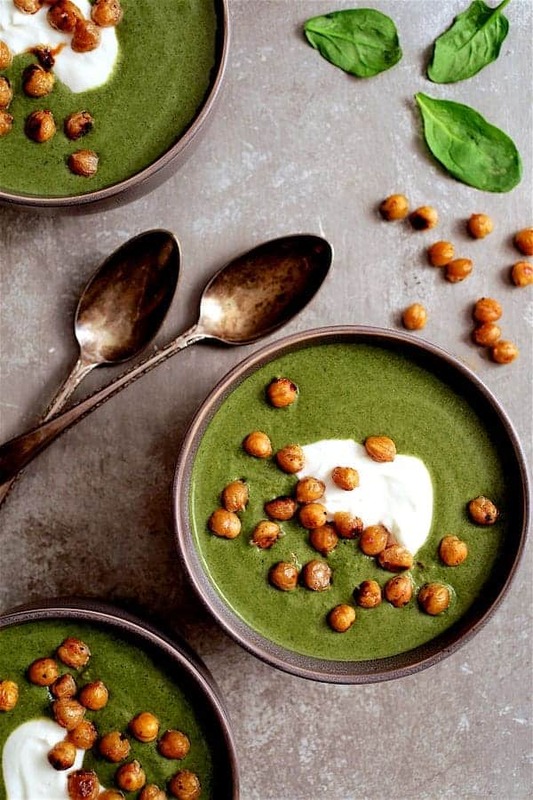 Spinach Goat Cheese Bisque is the perfect silky smooth and slightly decadent way to enjoy this nutrient-packed green. The spinach I bought for this soup actually was intended for spanikopita. Spanikopita is a dish I have not had in forever! There was a delightful little Greek restaurant just down the street from my apartment when I lived in Milwaukee 23-some-odd years ago. The spanikopita and saganaki were two of my favorite things to order there. Feeling nostalgic, I even went to the trouble of tracking down filo dough, which for some reason is suddenly hard to find around here. My husband was in a cooking mood over the Martin Luther King holiday weekend and made a huge pan of lasagna. When my husband is in a cooking mood, I let him have at it! Although I love my carbs, I do try to limit them and two carb-heavy dishes in the fridge for the week were too much. So, Spinach Goat Cheese Bisque with Crispy Lemon Chickpeas was born! First, get the chickpeas going. 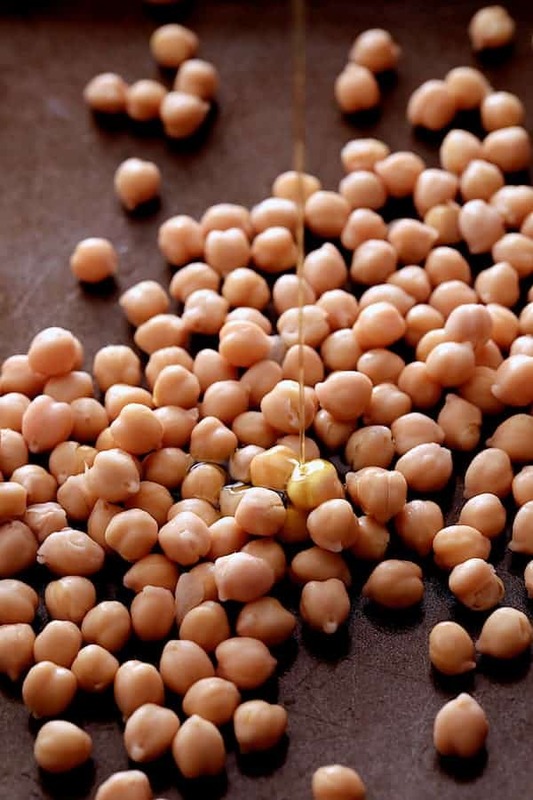 Drain and rinse a 15-ounce can of chickpeas (AKA garbanzo beans). Place them on paper towels and with more paper towels or a clean kitchen towel, pat them as dry as possible. It’s a good idea to gently rub them a little with the top towel to remove as many of the skins as possible. Removing the skins will help them get crispy. Then, place on a baking sheet, drizzle with olive oil and season with salt and black pepper. Pop them into a 400-degree oven and midway through, drizzle with lemon juice. Place back in the oven and…. 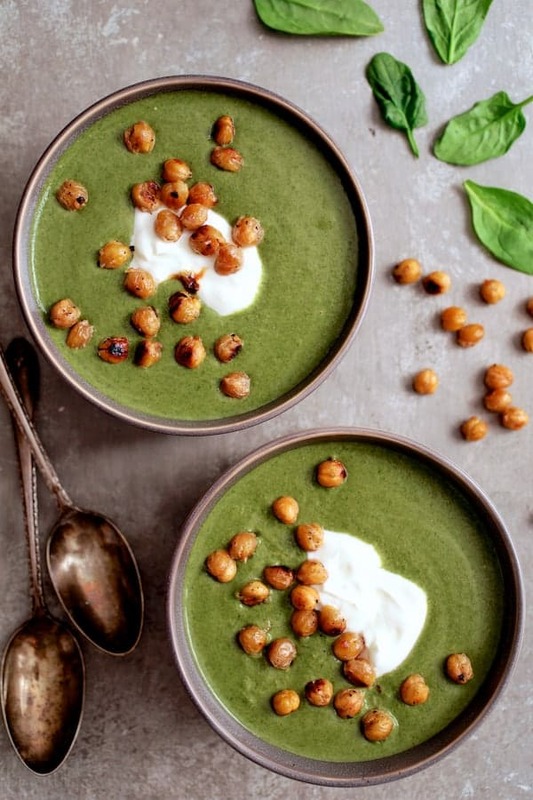 While the chickpeas are roasting, make the Spinach Goat Cheese Bisque. I love smooth soups because you don’t have to chop the onions carefully nor do you have to worry too much about how the soup looks. Cook everything together, puree and that mishmash of ingredients are transformed into a silky, creamy, elegant soup! I’ve made cream of spinach soup a time or two for clients and frozen chopped spinach works just as well and you don’t even need to squeeze the water out! 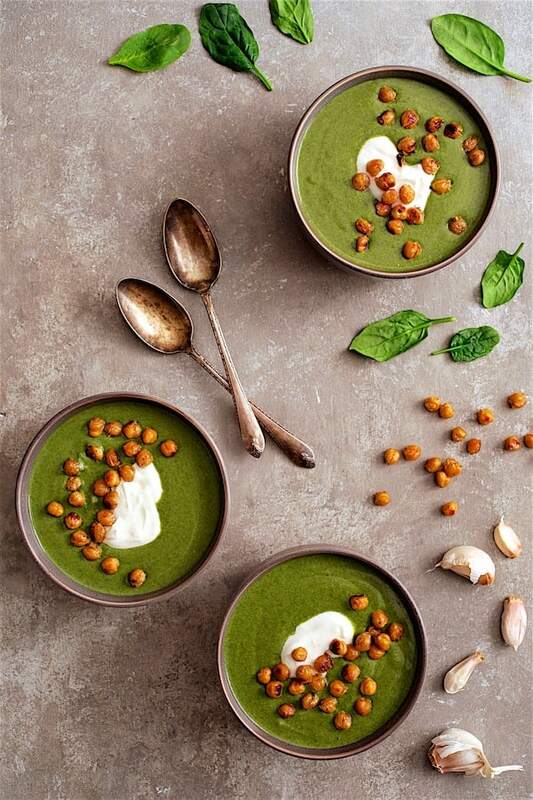 Spinach Goat Cheese Bisque is perfect for a light lunch or elegant starter for your next dinner party! 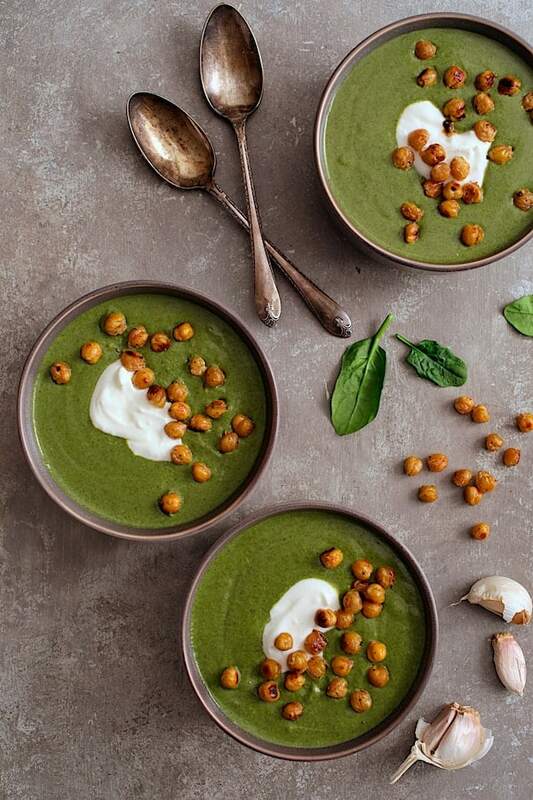 Serve the Spinach Goat Cheese Bisque with a dollop of Greek yogurt and the Crispy Lemon Chickpeas! Mwwaaahhhh! 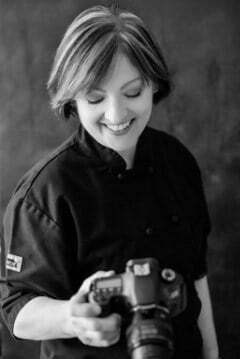 Be sure to try my other silky smooth soups! 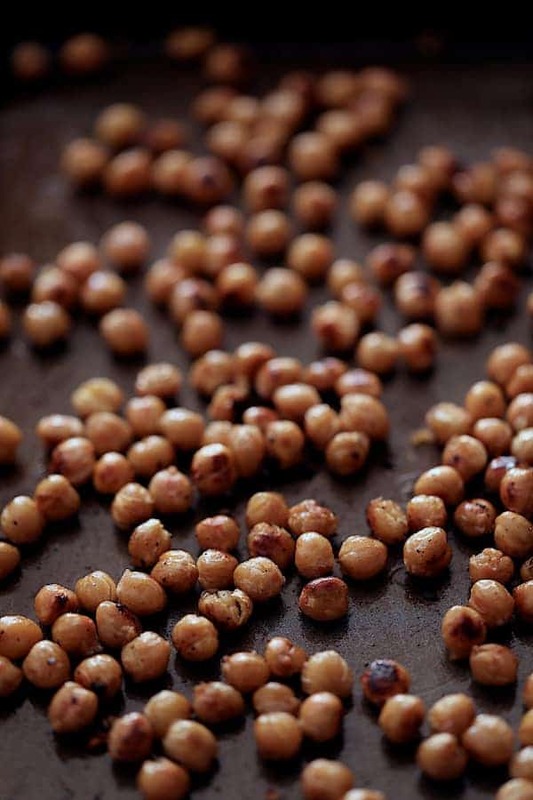 CHICKPEAS: Preheat oven to 400 degrees. Place chickpeas on a rimmed baking sheet. Drizzle with olive oil and season with salt and black pepper to taste. Roast for 15 minutes. Stir, drizzle with lemon juice then stir again. Place back in the oven and roast another 15 minutes or until crispy. Make the bisque while the chickpeas are roasting. BISQUE: Heat butter and olive oil in a large soup pot or Dutch oven over medium-high heat. Add the onion, reduce heat to medium and cook 7-8 minutes or until beginning to soften. Add the garlic and the rice and stir briefly to cook the garlic and coat the rice. Add the chicken or vegetable broth. Bring to a boil, reduce heat and simmer partially covered or until the rice is cooked. Add the spinach. If using fresh, add in batches as it wilts. Add nutmeg, cream and crumbled goat cheese. Stir until cheese melts. Puree with an immersion blender until very smooth. Alternately, place in a food processor or blender and puree in batches using caution with hot liquids. Serve with a dollop of Greek yogurt and chickpeas. If using frozen chopped spinach, there's no need to squeeze the spinach before adding to the soup; add the liquid and all.